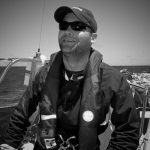 The late afternoon crossing of the Juan de Fuca Strait promised to be a cold, lumpy affair. Seas pushed by a steady 15-knot wind had built throughout the day. The abundant sunshine carried only the false promise of warmth. The brisk spring temperatures combined with a steady wind blowing over winter-cold waters would leave us chilled through by the time we reached our evening destination in Friday Harbor. While the captain prepared the Chelsea Lynn for the crossing with extra attention given to all things that might become flying projectiles in a heavy sea, I prepared one of the surefire dishes to satisfy any cold and hungry boater: a pot of seafood gumbo. Now, this staple of Louisiana cuisine isn’t a single recipe; it’s dozens, even hundreds, of recipes, refined and tested over the centuries by thousands of cooks. This recipe, in quite a different form, first came to me many years ago on a similar spring day in a different part of the continent. I had travelled to New Orleans on business, and made a point of contacting an old boating colleague, Faye Lewkowski, at the time editor of Living Aboard magazine, back when Living Aboard was little more than a folksy newsletter printed a few times a year whenever they could scrape some money together. Faye and her husband lived aboard their 40-foot Hunter on Lake Pontchartrain, the saltwater estuary that makes up part of the New Orleans waterfront. Ever gracious, Faye invited me to join her for a day sail. The wind blew hard off the Gulf of Mexico and across the low-lying outer islands and Lake Borge, and the urban marshes of Bayou Sauvage National Wildlife Refuge did little to impede it from reaching Lake Pontchartrain at full force. A steady formation of whitecaps rolled across the shallow lake. The air was chilly. For a couple of hours, we pounded our way across the lake on a course parallel to the Lake Pontchartrain Causeway, a 23-mile bridge that bisects the lake like an arrow through the heart. My knuckles turned white from the spring chill. Or from my death grip on the gunnel. We sailed way too fast and too far heeled over for any self-respecting powerboater to feel comfortable. My solace came in the occasional aroma that wafted up from the galley. Our one-pot lunch was fastened tight to the gimbaled stove, simmering while we sailed. By then, the only way I was going to be denied that wonderful southern stew was to be thrown overboard to become dinner for the live gators. And this recipe, passed on and refined through generations of cooks, made the perfect dish for a cold blustery spring day. Alligator gumbo warmed the soul as well as the body. Since then, it’s been a staple in my one-pot dishes for spring and autumn cruising. Over the years, I have adapted the recipe to meet my own tastes and to reflect ingredients common to the Northwest. Alligator is difficult to find in local fish markets. But shrimp, Dungeness crab, mussels, clams, oysters and halibut are not. Sometimes I throw them all in; other times I just use whatever we’ve caught. If we’ve been skunked, we still have a wonderful vegetarian gumbo. 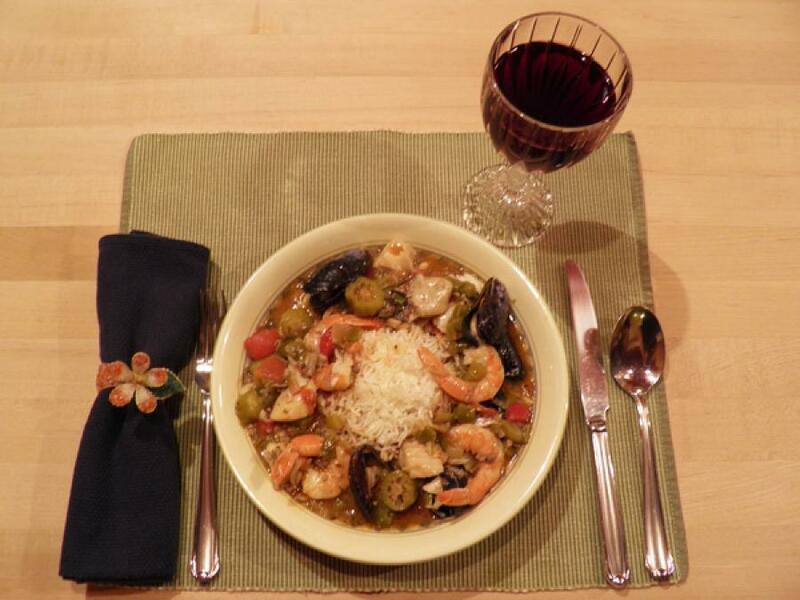 Whatever ingredients you decide to add, you’ll find this Cajun seafood gumbo to be the perfect meal when crossing a lumpy, cold strait in the spring. I like to prepare it ahead of time to the point of adding the seafood, then reheat it and stir in the fish when it’s time to eat. This gives the flavours time to develop. I like to think that my friend Faye had a pot of alligator gumbo on the gimbaled stove the night they lost their boat to Hurricane Katrina. In stock pot, add fish broth and clam juice and bring to a boil. Slowly whisk roux into hot broth. In skillet, sauté onion, celery, green pepper and garlic until tender. Add to stock pot. Add diced tomatoes and seasonings to the stock soup pot. Bring to a boil. Let simmer for about 30 minutes. You can make it to this point, then reheat later. Add seafood about 15 minutes before you want to eat, beginning with the raw halibut or cod and oysters, then mussels and shrimp, and finally the crab. A roux is simply a mixture of fat and flour, in equal proportions for this recipe, combined in a heavy skillet and browned slowly over medium heat to a deep caramel colour. Although I prefer butter, any type fat may be used; oil, butter, shortening or lard. The secret of a good roux is constant stirring, which prevents it from burning.